Another day in congress; another reprehensible giveaway to corporate special interests that prey upon vulnerable people. 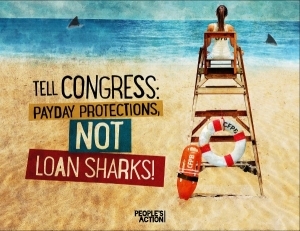 The latest entry in this dreadful parade: A vote in the U.S. House of Representatives to forbid the Consumer Financial Protection Bureau from…you guessed it…protecting consumers from financial abuse — in this case the 400% interest sharks in the “payday” loan business. “Faced with the opportunity to protect Americans from payday lenders and their 400% interest rate loans, a majority in the U.S. House of Representatives instead chose to side with America’s legalized loan sharks and 221 members of Congress are on the record giving a free pass to payday lenders. It was a simple up or down vote: vote yes and you support consumers and the rule of law, or vote no and allow payday lenders to break the law. Not surprisingly, the vote was almost exclusively partisan, with all but a couple of Democrats voting against the industry and all Republicans, save four, voting for it. 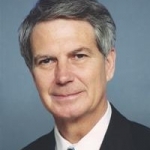 To his credit, the only Republican in the North Carolina delegation to stand up for average people was Rep. Walter Jones. Jones is, of course, a maverick and unpredictable on lots of issues, but in this case, he courageously did the right thing alongside Democratic members Alma Adams, G.K. Butterfield and David Price. Unfortunately, the rest of the delegation — Ted Budd, Virginia Foxx, George Holding, Richard Hudson, Patrick McHenry, Robert Pittenger, David Rouzer and Mark Walker — all, predictably, did the loan shark lobby’s bidding. The issue is not over. There will be more votes in both house on this issue. Let’s hope Jones’ stand helps shame his fellow conservative lawmakers into rethinking their positions. Why don’t payday loan customers go to their bank? Oh, because many have bad, little, or no credit and no bank wants them. In many cases the choices are missed rent and eviction or a payday loan. Or full a propane tank for heat and cooking or starve and freeze. Or fix a car so they can get to work, or lose their job and file for unemployment. How about paying for ridiculously priced prescription drugs? That is the real face of evil. Many lenders are licensed by the state(s) that they operate in. There is a need and these lenders are there. Taking away the lenders does not take away the consumer’s needs. These extremist views are nonsense. When these regulators put out new rules, companies either comply or run afoul. But those rules do little to change the habits of consumers that are getting turned upside down by their mistakes. This is where the CFPB should be focusing its efforts, to help consumers make informed choices with their credit. There will always be pitfalls, so its better to help consumers navigate them rather then playing regulatory whack-a-mole.